1. The copyright of each image should naturally rest with the participant. Using someone else's images is strictly forbidden and will attract disqualification. 2. A participant is allowed up to 3 entries in each theme. 3. A caption is compulsory and it must accompany every photograph. 4. Images should be in JPEG format and be resized so that the file size is a maximum of 1.5 MB or the width of the picture is 1200 pixels, whichever is lesser. Information about the camera/lens used is most welcome. 5. The Copyright of the images remains with the photographer and if at all Radio Sai wishes to use the images in any other way, it will seek permission from the photographer. 6. Even photos taken at an earlier period is acceptable as long as the photographs have been taken by the participant and he/she can furnish all details about the picture and the camera used. 8. 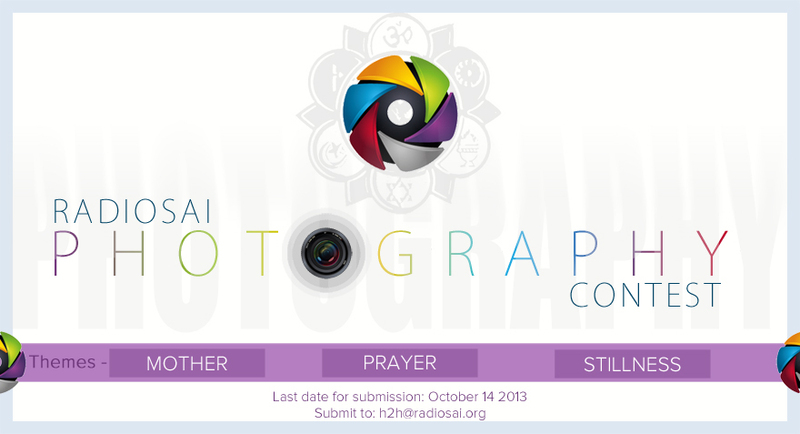 Last date for submission of entries is October 14 2013. 9. Participant's name and place must accompany every submission. All the best! Looking forward to lovely creativity! For any queries or clarifications, please write to [email protected]. Do not forget to mention your name and country.